It is with great excitement that I announce the release of the Final Report of the Toronto Hearings, which is titled The 9/11 Toronto Report. It is now available for purchase on Amazon.com, for a reduced introductory price of $12.76. I encourage you to review the content of the book using Amazon's "Look Inside" feature, and if you like the book, leave a positive five-star review. The book has already received a one-star review from someone who has not read the book, and we need to counteract these kinds of reviews. The 9/11 Toronto Report is a collection of essays submitted by the witnesses who presented at the International Hearings on the Events of September 11, 2001, which were held in Toronto, Canada over the 10th Anniversary of the attacks. I collected the essays, edited them, and arranged them into the chapters you find in the book. I believe it is the most succinct, comprehensive, and persuasive written treatment of the best evidence against the official story for 9/11 that has been produced to date. Those experts who contributed chapters include David Ray Griffin, Kevin Ryan, Peter Dale Scott, Graeme MacQueen, David Chandler, Barbara Honegger, Richard Gage and many others. The 9/11 Toronto Report also contains a written report and recommendation from each of the four distinguished panelists who heard the evidence presented over the four days of hearings and questioned the witnesses. The panelists include two eminent Canadian academics, an American civil engineer and academic, and the most famous and influential judge in Italy and honorary president of the Italian Supreme Court, Ferdinando Imposimato. As you will read in the final chapters of the Report, the opinions of these four individuals, each of which carries credibility and weight that cannot be disputed, make a clear and unmistakable case that the official account of 9/11 is false, and that the only way to realize truth and accountability is to tear down the wall of secrecy and lies that has been erected by the United States government around the events of 9/11. Speakers will be video archived here after the broadcast. Prolific 9/11 researcher Kevin Ryan of the 9/11 Working Group of Bloomington joins The Corbett Report to discuss his recent article, “Secret Service Failures on 9/11: A Call for Transparency.” He outlines some of the unusual behaviours displayed by the secret service on 9/11 and points out discrepancies in the 9/11 timeline. We also discuss the Toronto Hearings on 9/11 which took place last year on the 10th anniversary of the events, a DVD of which is now available for purchase. 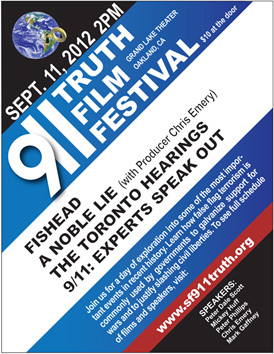 The Toronto Hearings were held at Ryerson University in Toronto, Canada, during the 10th anniversary weekend of 9/11. ENGLEWOOD — After the initial shock of the Sept. 11 destruction of the Twin Towers, after the dust settled on the official explanations of what caused the towers to fall, Jonathan Cole had questions and no real answers. Cole is not given to wearing tin-foil hats or looking up into the dark sky over Roswell for aliens. He’s an engineer and believes in the fundamentals of science. Cole has been asked to share his research and the results of experiments at a conference in Toronto from Sept. 8 to Sept. 11 questioning the credibility of the official reports on the Sept. 11 attacks. The International Hearings on Sept. 11, 2001 is sponsored by the International Center for 9/11 Studies and will be held at Toronto’s Ryerson University. An excerpt from that interview will also be played in the next episode of my podcast (#197) which will be released Saturday August 27th which will deal with various 9/11 10th anniversary events. Canada's largest right wing newspaper has published an article on the Toronto Hearings. The article is biased toward the official story of course. There is a comment section which has a lot of ill-informed and offensive comments. Initially they allowed commenting without registering, however now they require you to register.